A friend recently had her 3rd baby. A little boy. He is a very lucky little man with 2 older sisters - at 8 and 5 years old, he is sure to be looked out for. I couldn't bring myself to buy him a birthday gift. Mostly because I like to 'make'. But also because I know that no one else will have given the same thing if I give him something hand made. 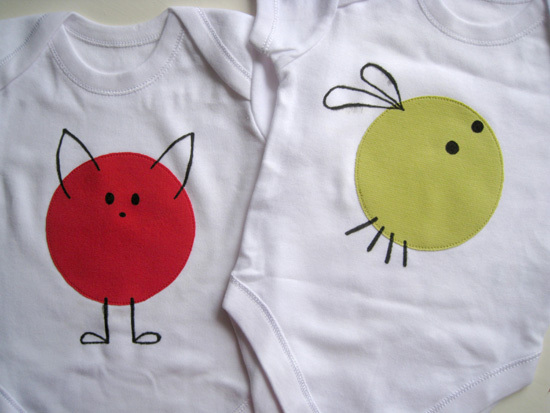 So, I bought two 3-6mth sized white body suits and embellished them with spot creatures. Coloured body suits would have been more fun, but I couldn't find any at the time. It was really easy...all I did was cut out 2 circles of Bondaweb and fuse them to my coloured fabric. Then I cut out the circles and fused them to the body suits. I sewed the circles on with a straight stitch on my sewing machine. For the black lines I used a Crayola fabric marker pen. Stupidly, I drew the lines on with a blue water soluble pen first. I have had issues with soluble pens where once ironed the pen doesn't wash off, so I tried to remove most of the blue before ironing the black pen. Stupid, silly me...of course the black pen would bleed with the water. So...if you are going to give this a try - I would use an air marker...one of those that vanish by themselves. Know the ones I mean? Like this one? Also, it is helpful to slip a sheet of sandpaper under your fabric to stop it from slipping around while you draw. I am really hoping that the worst of the bleed will wash out. Sorry little guy, I hate to give a sub-standard gift. Here are the, um, fox (?) and the bee. 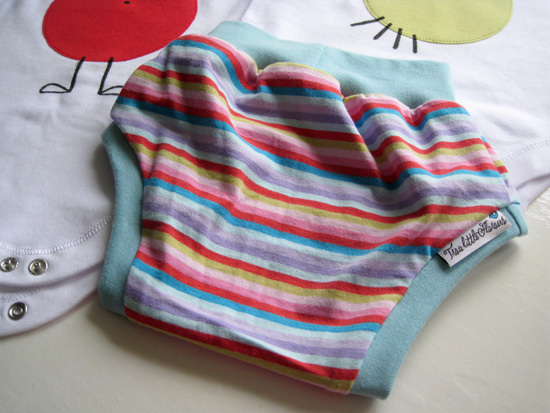 I also made a special co-ordinating pair of my baby hot pants for the little chappie. This is the bum view, with the label nicely located so it isn't scratchy on is lovely soft skin. As he is just about 1 month old, he should have some wear of these during our summer. That is, if the weather ever heats up! For his big sisters, they each have a circle skirt - made from two of the lovely soft Pat Bravo fabrics that I have in my shop.